300 TCD [Trinity College Dublin] students signed a petition today supporting a new Young Greens society…. Posted in Misc and tagged Eamon Ryan, Young Greens at 4:54 pm on November 25, 2014 by Broadsheet. 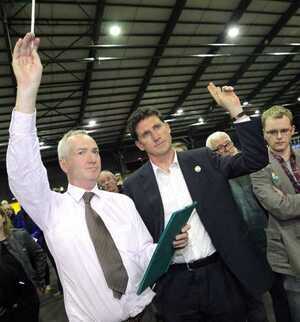 (Top) Brian Hayes and Eamon Ryan (above) calling for a recount. 4am: A night of high drama in the RDS, Ballsbridge, Dublin as the Dublin European election went to a 7th count to decide the final 2 seats. Lynn Boylan of Sinn Féin was the first candidate to be elected on count 3 after recording an initial 83,264 first preferences votes. By count 7, it came down to Eamon Ryan (Green), Nessa Childers (Ind) and Brian Hayes (Fine Gael) for the remaining two seats. It ended with victory to Childers (73,598) and Hayes (73,405) with Ryan closely behind on 72,256 votes who immediately asked for a recount. 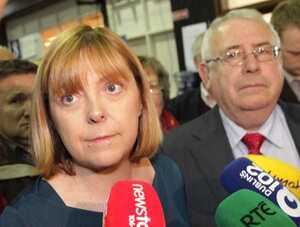 A decision on whether a recount will be held will be made at 2pm this afternoon. 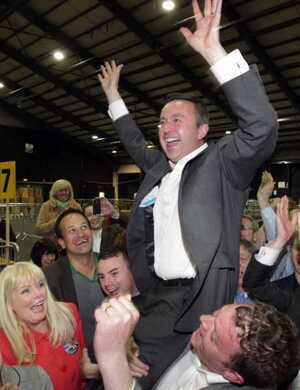 If Brian Hayes is elected, a by-election in Dublin South West will be needed to decide his vacant Dáil seat. From top: Lynn Boylan (Sinn Fein) following the third count; and the eliminated: Emer Costello (Labour) with her husband Joe Costello TD and Mary Fitzpatrick (Fianna Fail). Posted in News, Politics and tagged Brian Hayes, Eamon Ryan, Lynn Boylan, Nessa Childers, Sinn Fein at 6:18 am on May 26, 2014 by Admin. 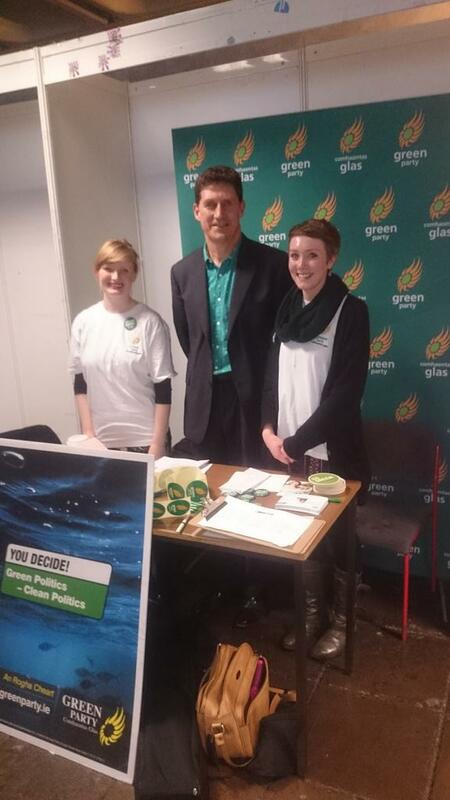 Irish Times political correspondent Harry McGee shadowed Green Party leader and European election candidate Eamon Ryan for a day in Dublin. Posted in Politics and tagged Eamon Ryan, European Elections 2014, Green Party at 2:57 pm on May 20, 2014 by Admin. In early 2011, a study on the setting up of Irish Water – carried out by PricewaterhouseCoopers and McCann Fitzgerald – was to be delivered to the Department of the Environment by the following September, and that Bord na Móna had expressed an interest in taking on the role. 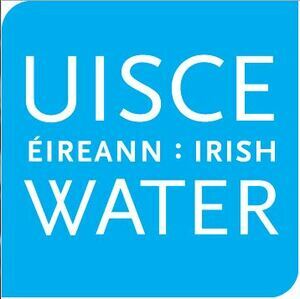 In April 2012, the tender for Irish Water was awarded to Bord Gáis. Environment minister Phil Hogan said ‘the outside assessors..had made the decision based on a long list of criteria’. 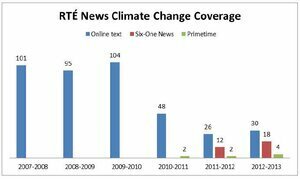 On last night’s Tonight with Vincent Browne on TV3, former minister Eamon Ryan – who was joined on the panel by Harry McGee, political correspondent with the Irish Times; Joan Collins, TD from the United Left Alliance and Damien English, TD from Fine Gael – brought up the PWC report and claimed Fine Gael and Labour changed the report’s terms of reference without any public announcement. 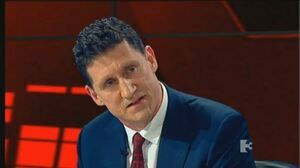 Eamon Ryan: “You [to Damien English] said there that you looked at all the options, you didn’t. You came in to Government there was a PricewaterhouseCoopers study looking at various different ways you could do it without any public announcement, the terms of reference of that study was changed because, as I said, there was a deal done already be Fine Gael and Labour into how it would be done. Earlier in the show, Mr McGee summed up the immediate problems that Labour face due to the developing crisis facing Irish Water. McGee: “And I guarantee they won’t get it right until after the 23rd [of May, when the local and European elections take place]. Posted in Misc and tagged Eamon Ryan, Irish Water, Vincent Browne at 8:24 am on April 25, 2014 by Admin.